Elegant, gated, custom estate in one of Charlotte's most desirable areas. This prestigious residence with three car attached garage is the epitome of perfection. 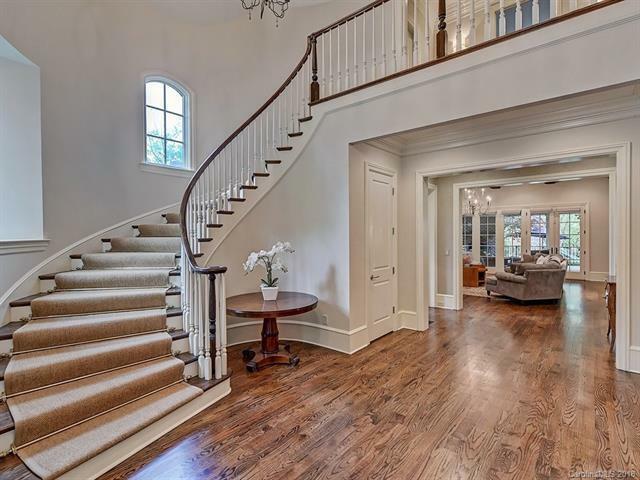 A grand 2-story foyer & curved staircase set the stage for this exquisite home, still with all the traditional touches. Beautiful oak hardwood flooring & high ceilings lead to a sophisticated great room with open gourmet kitchen & exceptional views of the outdoor fireplace, built-in Viking pizza oven, grill, fridge plus hanging bed & dining space. Kitchen features pantry with second refrigerator, 2 ovens, butlers pantry & scullery with 2nd dishwasher. Opulent master suite on main with fireplace, luxurious bath & heated floors. Master suite also boasts a wet bar, exercise room & private rear porch. Lush greenery, a gorgeous pool & cabana with stone fireplace create a secluded enclave for this stunning property. Upper level includes large bonus/play room, 4 en suite bedrooms, laundry room, a 2nd half bath & cedar storage closet.